America’s most controversial documentary, Vaxxed: From Cover-Up to Catastrophe from Cinema Libre Studios, premiered in Belgium, the U.K and France over this last week despite significant censorship attempts by some members of the European Parliament, by Parisian government officials, and a U.K. cinema owner. At the same time, Del Bigtree, one of the producers of Vaxxed, joined Robert F. Kennedy, Jr. and Robert De Niro at the National Press Club to announce a $100,000 challenge with the goal of stopping the use of mercury in vaccines. Vaxxed investigates the charges made by a whistleblower at the Centers for Disease Control and Prevention, the leading national public health institute of the United States, who revealed that the agency manipulated and destroyed data on an important study showing a causal link between the Measles-Mumps-Rubella (MMR) vaccine and autism. The film, which calls for safer vaccines, was released in 2016 in North America amidst significant controversy for its criticism of the CDC and the pharmaceutical industry. 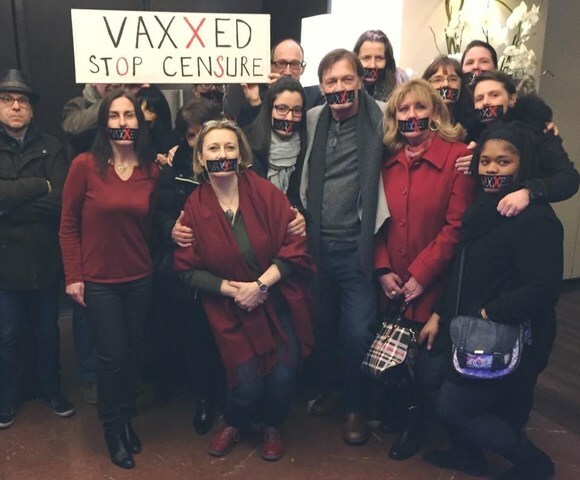 Vaxxed was scheduled to screen last week at the European Parliament in Brussels as part of a conference on vaccine safety, organized and hosted by a French MEP. Due to a disinformation campaign led by a small, but vocal, opposition group with purported ties to the pharmaceutical industry, some Members of the European Parliament made the decision to censor the film and prevent it from screening at the Parliament. Both the screening and this unprecedented vaccine safety conference moved locations and took place on February 9th with a discussion following that included the film’s director, Dr. Andrew Wakefield, Nobel Prize winning virologist Luc Montagnier, MEP Michele Rivasi, and the Italian nanotechnology researcher Stefano Montanari. An additional debate on Vaccine safety was hosted in this venue on the same afternoon. Opened to the public of Brussels, this second debate lined-up several major experts on the question of vaccines safety, including lawyers, scientists and whistleblowers hailing from different European countries for the occasion. This second debate was followed by an additional screening of Vaxxed with 300 people in attendance the entire day. A second Paris screening was scheduled for Monday, February 13th, by the same MEP, as part of a vaccine safety debate to take place at a City Hall venue in the 2ndarrondissement. That screening was cancelled by a top Paris city official who never even saw the film. The screening and vaccine safety debate, with Wakefield in attendance, also moved to an alternate venue, with 155 people in attendance and a clear “Stop the Censure” message by the public. In London, a premiere at the Curzon Cinemas was also cancelled due to a phone campaign organized by the same opposition group. The February 14th London premiere of Vaxxed was moved to an alternative venue and continued with director Wakefield in attendance. Yesterday, Vaxxed producer Del Bigtree joined Robert F. Kennedy, Jr. and Robert De Niro on stage at the National Press Club in Washington D.C., as part of a World Mercury Project press conference to announce a $100,000 award to any journalist who could produce a single study that conclusively showed that it was safe to inject pregnant women and children with levels of mercury that are currently found in common vaccines. Vaxxed captured international headlines last year after it was “de-selected” from the Tribeca Film Festival due to pressure put on the festival’s organizers from sponsors with connections to the pharmaceutical industry. Despite numerous attempts at incorrectly labeling the film as “anti-vaccine” and overt censorship from festivals and media outlets, the film was released theatrically in over 60 U.S and Canadian cities, with an additional 500 screening events, has grossed over $1.2 million at the box office and sold tens of thousands of DVDs and digital streams. The filmmakers have been touring the nation by bus, (the Vaxxed tour), and have recorded nearly ten thousand vaccine injury stories. Since widening its release, the film has also experienced organized censorship in Italy and Australia.